Can Mesh Be Resized in Phoenix Builder Without Starting Over from the Beginning? I have been able to take a model from X-Plane to SketchUp, re-texture it in SketchUp, run it through Blender, import it into Phoenix Builder, add the physics, and have a nice-looking, nice-flying model in the Phoenix flight sim. After I completed that process, flight tests showed that the wing's chord needed to be enlarged somewhat for better performance. I can fly the model with the old mesh and the new physics, but if I wanted to publish it in Phoenix for others to use, ideally the mesh would be changed to match the new physics. Otherwise, the model would be somewhat misleading, because it still looks scale but the physics is not. I'm willing to change the mesh, but not if it means re-importing the modified .obj file to Builder and rebuilding the model from the start, renaming files, creating the physics, bla bla bla (in other words, a lot of work). 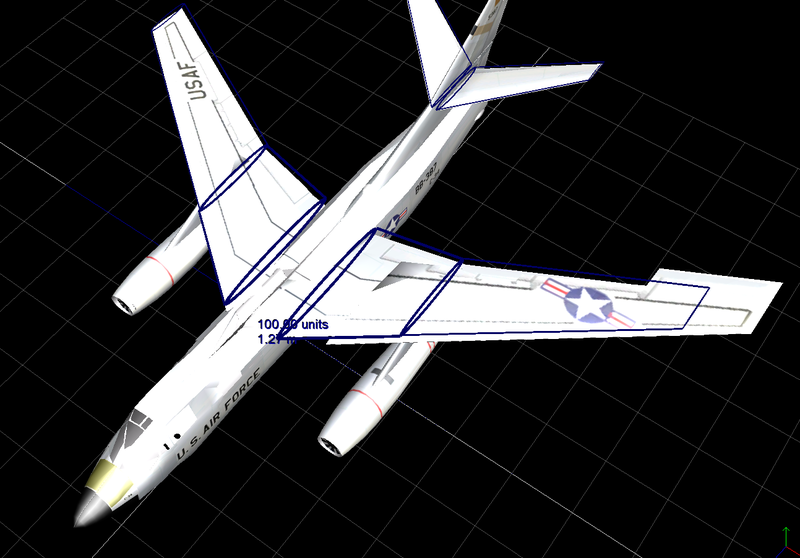 I've tried re-scaling the wing meshes in Builder, but that doesn't change the model's appearance in the flight sim. I even tried copying and pasting code in the .modx file, but, as I expected, that simply caused Builder to crash. My purpose in building and flying the model was to test concepts before building a real-world model. My goals can be met without changing the appearance of the flight-sim model. But, as I say earlier, it would be nice to publish the model because it is not bad looking at all and is fun to fly. Strangely, if I use the Scale settings to change the size of something like a nacelle, it works. But when I try to do the same thing for a wing mesh, it doesn't. I thought that maybe the reason the nacelle resizing worked and the wing resizing didn't was because in the latter case I had moved the node to the Airfoils section in the node list. So, I opened an earlier iteration of the .modx file, where the outer-wing nodes had not been moved. I enlarged the wing textures arbitrarily for test purposes. Below is an image of what the left out wing looked like in Builder after the change. However, the change did not carry over into the flight sim. The wings look the same as usual. It's a mystery to me why the nacelles could be resized in Builder and showed up in the flight sim, but not the wing textures. I've pretty much run out of ideas.